JIM: THE JAMES FOLEY STORY is a moving and competently made documentary about the journalist captured in Syria and executed by ISIS - the first American victim of the terrorist group. The strength of the film is to take us into the emotional landscape of his family for two hours so that when we finally get the moment of his death - now so iconic - we really feel the tragedy of losing a good and beloved man. The emotional punch in undeniable. The downside of focussing so much on his wonderful family is that we almost become too reverential of James and too narrow in our focus. Questions of naivety and poor decision making are picked up but quickly brushed off. And the thorny issue of why some governments choose to successfully negotiate for their captives release and others do not - allegations of a lack of US governmental support - are not properly investigated. 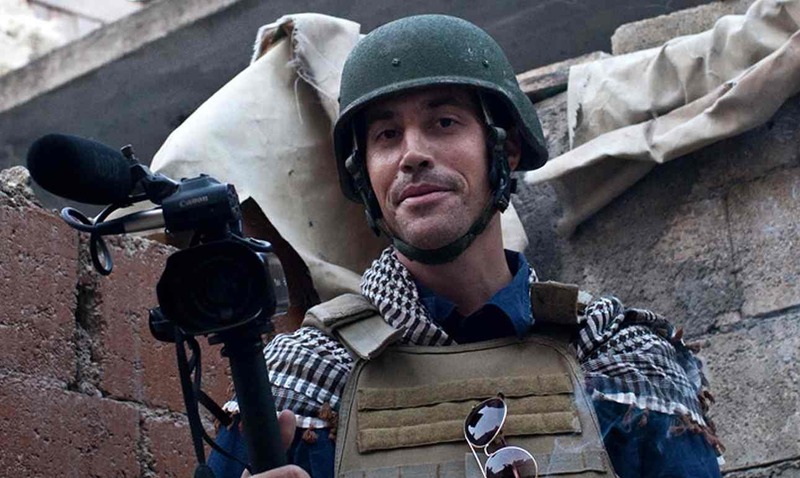 In other words, this is a great documentary if you want to get to know James Foley - and it's worthwhile just on that basis - but it's not totally satisfying. The Jim that we meet is a good boy from a lovely middle class Catholic family from New Hampshire. He's educated at a Jesuit university and decides to pursue a career in journalism by way of being a teacher. His life choices are looked upon as odd and unconventional by his siblings but they support him anyway. Jim becomes a journalist when conventional news desks have been wound down by most newspapers. He's a freelancer. And a question I wondered about but which the documentary didn't tackle is whether this new cheaper business model raises the danger level for journalists. How far would James, if trained by, say, the BBC have made different decisions, or his family have been better supported, or the government more ready to act? I got the feeling that there's a whole generation of vocational war reporters that we're hanging out to dry. But as I said, that's not covered here. We see James go to Libya, thriving on the adrenaline of getting to the front-line, but captured and imprisoned by Gaddafi's men. He's released 44 days later and goes home. He's offered an editorial post but has itchy feet. As many of his colleagues say, the itch to cover warzones has to be scratched. They choose to do what they do because they think it's important to get the story out. And thank god they do despite the considerable personal danger. So he goes to Syria and is abducted by ISIS and held in custody for over a year with a mix of other journalists who become his new family. The director of the documentary chooses to depict this with subtle re-enactments which are hugely effective at enhancing the narrative told by his fellow inmates, all of whom survived because their governments negotiated with them. It's in the final half hour that the emotional toll on James' family is the most visible and awful, and the context of of his death most harrowing. When we finally see him kneeling down in an orange jump suit he isn't an abstract victim of justice, but has been restored to a real man - flawed but kind and brave - trying his best to be strong - and the power is unmistakeable. This film is, then, a fitting tribute to a good man and his lovely family, and makes an important point about not taking foreign reporting for granted. Someone has to be there, and when the internet kills advertising revenue and mainstream news organisations draw in their horns, it's going to be young, relatively alone freelancers like Jim. I have a newfound respect for their courage and mission. JIM: THE JAMES FOLEY STORY has a running time of 111 minutes and is rated 15 for strong language, images of real dead bodies and real injury detail. The movie won the Audience Award - Documentary at Sundance 2016. The movie had its TV premiere in the USA earlier this year and is currently on release in cinemas and on demand in the UK.